My Life with Pipidinko: Christmas Countdown Activities. Day 5. Popsicle Sticks Ornaments. Christmas Countdown Activities. Day 5. 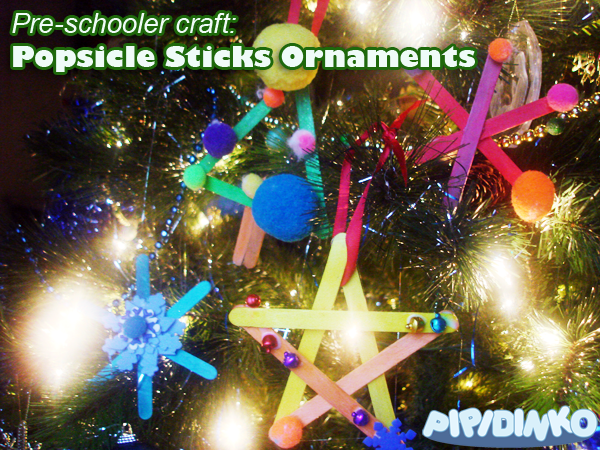 Popsicle Sticks Ornaments. Santino and his best friend Joe had a play date in our house. To let them do something different from jumping on a trampoline and dumping all the toys on the floor, I suggested we do a little Christmas craft. I hot glued the sticks together, then put some pompoms, tiny bells, and foam snowflakes on a plate and took out a bottle of glue. At first I put a few drops of glue here and there and boys picked decorations and put them on the ornaments. Pretty soon, Santino took over the glue and just squeezed it and glued the snowflakes and pompoms where ever he pleased. He particularly enjoyed arranging foam snowflakes on one another in the middle of a snowflake ornament. I was pretty impressed with the whole idea. A few weeks ago I was told that Santino is very creative. I don't notice these things, I guess. To me, Santino doesn't seem being interested in anything, but running around and roaring like a dinosaur. It is when he slows down and takes his mind off the whole pre-historic lizards thing, he becomes attentive, artistic and creative. I just want to keep injecting a few minutes of arts and crafts every day, and hope that it sticks with him for life.